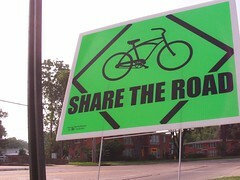 Those green Share the Road signs are the work of Ian Webb, the owner of River City Cycling. You can pick one up for $5 and plop it down in your neighborhood. Webb says he wants to make folks more aware of two wheeling in SB Land. KSLA has a good story on Webb and how he even takes his child to school using bike power. Sherri Talley at KTBS did a post on the Share the Road at her blog. Shreveport Times intern A.J. King explores alternative ways to get to around SB Land. Did Your House Make the Cut?